Mega-City One, 2130 AD. This vast urban nightmare on the east coast of post-apocalyptic North America is home to 400 million citizens, every one a potential criminal. With lawlessness rife, only the Judges can prevent total anarchy. These future lawmen are judge, jury and executioner. Toughest of them all is Judge Dredd - he is the law! Inspired by Clint Eastwood in Dirty Harry; the film poster for Death Race 2000. 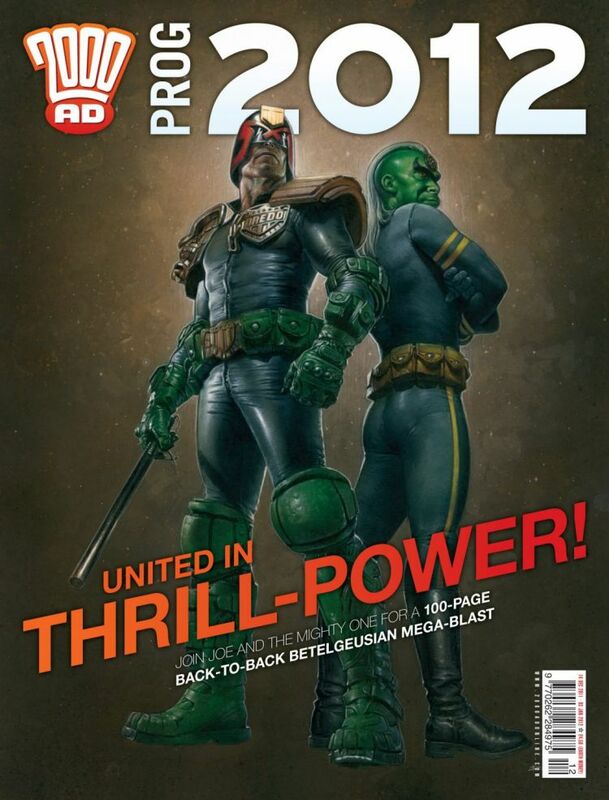 The name Judge Dredd came from Pat Mills who was originally going to use it for a different character. The first Judge Dredd story published was drawn by Mike McMahon, not co-creator Carlos Ezquerra. Ezquerra was so upset that he didn't draw Dredd for five years afterwards, only returning for the Apocalypse War mega-epic. Following the gladiator slave Spartacus’s failed revolt against his Roman masters, his army of rebels was crucified along the Via Apia. Among the six thousand screaming figures is the former slave-turned-gladiator known only as AQUILA. North America, the near future. The Global Exo Segregation Zone – aka the GREY AREA – is a huge sector in Arizona given over to housing the large number of extra-terrestrial immigrants that arrive on Earth seeking a new home. A massive shanty town that acts as a holding area, it’s policed by Exo Transfer Control squads, heavily armed and armoured cops that patrol and keep the peace amongst the aliens. Another Britain, 1981. Following the Victorian Spiritualist movement’s ability to capture otherworldly beings, the economy is built on spectre-trading. Spartacus DANDRIDGE was a ghostfinder at the turn of the century until he was shot dead. His spirit held captive for decades, he escaped, returned to corporeality and made his way home to his mansion, where he lives with his fanatically loyal and mute manservant Shelley. The swollen city of Downlode lies sprawled across the heart of future Europe like a hit-and-run victim. Here, life is cheap - if you want someone whacked, you can't buy better bullet monkeys than Finnigan SINISTER and Ramone DEXTER, the city's primo hitmen. Inspired by John Travolta and Samuel L. Jackson in Pulp Fiction. Artist Jason Brashill declined the chance to co-create Sinister Dexter but he did paint the cover image to promote the characters' first appearance in Prog 981. Sinister is Latin for left, while Dexter is Latin for right. Late 22nd century. After the Atomic Wars of 2150, many survivors were warped by the Strontium 90 fallout. These 'mutants' became a vicitmised underclass, and the only job open to them was bounty hunting. One such STRONTIUM DOG is Johnny Alpha, partnered with his Viking buddy Wulf Sternhammer.